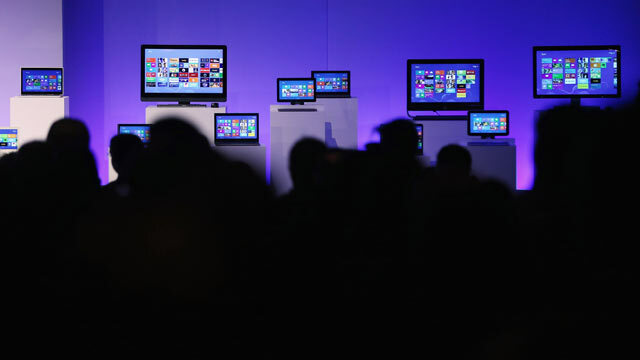 People sit in front of devices running the Microsoft Windows 8 operating system at a press conference launch of the system, Oct. 25, 2012, in New York City. Microsoft has been listening to the complaints about Windows 8 and plans to do something about them. The company announced today Windows Blue, an update to Windows 8 that will improve and add a host of features to the operating system, which was released last October for laptops, desktops and tablets. "When we set out to build Windows 8 we set ourselves up for a mobile computing change. All the changes were necessary to make that forward progress – adding the store, building out the store, adding apps and touch and an entire new user experience," Tami Reller, Microsoft's chief marketing officer and CFO for Windows, told ABC News. "It was a great foundation and there is a lot to build on." Since releasing Windows 8, Microsoft has sold over 100 million licenses, however users have said that the software changes were confusing. Recently, analyst firm IDC blamed Windows 8's "radical changes" and "removal of the familiar Start button" for one of the steepest declines in PC sales in history. Windows Blue, which will be out before the end of the year, plans to address those grievances. Reller said Blue, which is just a codename for the software and won't be called that when released, would include three core features. The first is that it will continue with the general Windows 8 design. It will maintain the same look and feel as the current software, with the tile-based interface, app store and multi-tasking features. However, there will be change and the main one will address customer feedback and some of those confusing aspects of the interface. "The learning curve is absolutely real, given the level of change. We can do work to address that. We see a lot of where customers could use some more help from us," Reller said. When asked if the new version would bring back the Start button, Reller wouldn't directly answer the question but said "we have heard the feedback on that, and it's one of many pieces of feedback we have listened to with an open mind." ZDNet's Mary Jo Foley reported last month that the new version of Windows would bring back the Start button, but clicking it from the Windows desktop would just bring you back to the Start Screen, or tile-based homescreen. It wouldn't launch the traditional Start menu. She also said that the changes would make it easier to use the software on non-touchscreen computers. Industry analysts believe those changes go hand in hand. "The removal of the Start button was emblematic of Microsoft's problems. It was trying to make a statement, forcing consumers into using the touch-optimized UI. All too often, however, they would need to immediately switch back to the desktop," Ross Rubin, principal analyst of Reticle Research, told ABC News. "Microsoft's reinstatement of it would ease the transition but also be an acknowledgement that the new Windows 8 app environment isn't progressing as quickly as they would like." The last major change will add support for smaller-screened devices and other types of hardware. "It will enable a new class of small devices and gives us the opportunity to take advantage of the latest, high-resolution screens, and better support for 7- and 8-inch form factors," Reller shared. Most Windows 8 tablets have 10.1 to 11.6-inch screens; smaller-screened tablets, such as 7.9-inch Apple's iPad Mini and 7-inch Google's Nexus 7, have become popular tablet choices. However, Rubin wonders how successful Windows 8 will be on smaller form factors. "It's difficult to see how Windows 8 would have much luck against the iPad mini or Kindle Fire HD. The promise of Windows on tablets has been support for legacy devices and apps; these are less important with the content-consumption usage model of smaller tablets," Rubin said. He also mentioned that Microsoft's Store doesn't have as many apps as the respective Apple and Android app stores. Reller said Blue pricing would be announced later. However, all those changes aren't a reflection of returns or poor Windows 8 sales, Reller says. As of this month, Microsoft has sold 100 million Windows 8 licenses; the same amount Windows 7 sold in its first six months. Those are the sales of Windows 8 licenses to computer manufacturers and to those who have upgraded a previous version of Windows; it doesn't mean that's how many Windows 8 computers have been sold to customers. "Overall awareness and interest in product has been strong and remains strong," Reller stressed. "There is a lot more interest from customers in our touch PCs and in our tablets, but those have been slower to get to volume than we would have liked." That is a result of the higher prices associated with touchscreen computers. "Microsoft bet big that touchscreen prices would come down, but there is still a significant premium associated with them," Rubin said. "Of course you can get it without the touch, but Windows 8 is optimized for a touchscreen experience." Microsoft says it is aware of that issue and is working on the usability without a touchscreen and the prices. "Do we want to see more price-competitive tablets in the market across sizes and chipsets? Absolutely. We are doing that work pre-Blue and with Blue to make sure that happens," she said. Still, she added, Microsoft believes that the price of the Surface RT, which costs $599 for the keyboard and tablet, has a stronger value proposition than Apple's $499 iPad. Reller declined to reveal Surface RT and Surface Pro sales figures. When asked about the latest IDC report, which found that shipments of PCs plunged 14 percent in the first quarter of this year, Reller said Microsoft's numbers tell a different story. "IDC reports from manufacturers into the channel. Our activation numbers measure when Windows 8 get consumed by PCs and come online, both are important to us," she said. So how exactly is Microsoft gauging user response if not for returns or sales? Actual user interaction with the software, online feedback, customer satisfaction and service data, and a host of other sources, Reller says. "We are getting meaningful feedback through telemetry -- anonymous user telemetry. We see how customers are using the product, that's a big set of data points," she explained. Microsoft plans to detail the exact changes in Blue over the next couple of months. However, even before Blue or Windows 8.X is released Reller said there will be significant new apps coming to the app store and a series of new computers with higher resolution screens and thinner designs arriving in time for back-to-school season. "People are continuing on using the product," she said. "We want to shorten the learning curve with customers."